The Divergent Series by Veronica Roth – It's Time to Read! The first book in The Divergent Series – aptly named Divergent – is easily my favourite of the three. What a great introduction to the series and to the characters. Divergent is a great story. There is everything you could want – action, risk taking, murder, war, friendship and love. I don’t think Roth could have crammed anything else into this novel. I could not put this book down. I had to keep going, I was sucked into the story and needed to know what was going to happen. When this book finished, I was desperate to read Insurgent. This novel left me wanting more and it was easy to rate it 5 out of 5. I didn’t enjoy Insurgent as much as I hoped I would. 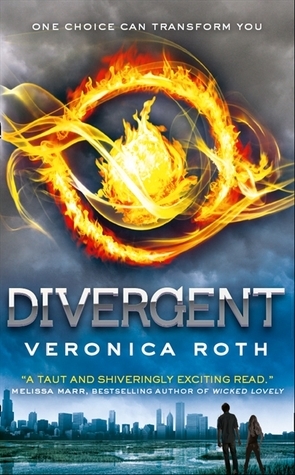 Don’t get me wrong – this is a good book – it just wasn’t up to the standard of Divergent. I found the beginning slow to get going. A lot of the action was at the end of the book – but what a great cliff hanger! This book is similar to the first in that it contains action and war, plus love. It has the added element of having to make really tough decisions – such as forgiving your friend for shooting your boyfriend and choosing which bad parent to follow – the manipulative one who left or the abusive one. We see the characters develop and we see Tris work through feelings of guilt and grief. War is taking its toll on her and Four is struggling to help her. 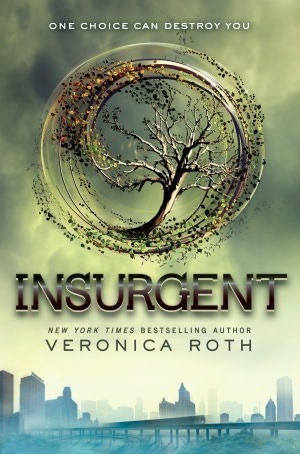 Insurgent introduces more characters – again, some I liked, such as Cara who showed great strength when she forgave her brother’s killer, and more to dislike. People like Jeanine, who were so scared of losing power they were prepared to kill almost anyone and everyone. I rated this book 4 out of 5 because I found the beginning slow. However, once the action started this book transformed and I was hooked all over again and eager for the final installment. 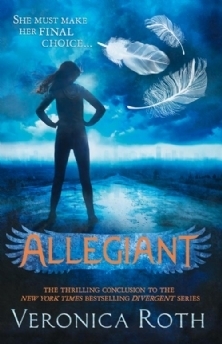 Divergent fans had to wait a long time for the final installment, Allegiant, to be published. To be honest, at first it felt a little bit like a let down. Tris and Tobias, plus a small army of friends, have left Chicago to discover what lies beyond the wall. Roth seemed to use half the book to explain their existence. There was a lot of background and a lot of science. To be honest, I’m not sure how much of that half of the book I took in. It wasn’t the explosive beginning I was hoping for and I found that not a lot happened in those pages. That said, again war broke out and the book became exciting! I think Roth writes action better than she writes background. I wasn’t sure about the dual perspective either. It came as a bit of shock to be reading one chapter from Tris’ point of view, and then the next from Tobias’. I like one of the things I liked about Divergent was his mysterious character. I didn’t like that he was suddenly stripped bare and I got to see how he felt. He seemed weaker than I had envisioned him and that spoilt the book somewhat for me. I must mention the ending. I don’t want to give anything away but I didn’t see it coming and I didn’t like it! It fitted with the characters and the story but it was not the ending I was expecting. It worked, but it saddened me. I rated this book 4 out of 5 as well because I thought once the story moved away from the background information and we got going, the book was great and I had to keep reading. Wish there were books like these when I was younger. I fear i’m really to old to read them now! Pingback: 2014 Reading: #22 Lauren Oliver’s Delirium | It's Time to Read! Pingback: The Delirium Trilogy by Lauren Oliver | It's Time to Read!